Make no mistake, there's a lot involved in getting a mortgage loan. You wouldn't be here on our website if you could fill out a one-page application and get the best loan for you funded the same day. What we do is most of the heavy lifting for you, so you can concentrate on what's important -- preparing to move into your new home and saving money. There are five main steps involved in getting a loan. You'll see that we've made your part in them as easy as possible, and we do all the work! That's what we're here for. This is where the rubber meets the road and you save the most money. You supply information about your employment, your assets, your residence history, and so on. Then, we get your permission to review your credit score & report. When we review all this information we give you a pre-qualification letter. This gives you an idea of how much of a home you can afford. Once you've made an offer and it's been accepted, it's time to complete the loan application. It couldn't be easier, and you can do it online, right here at our website. When the time is right, we'll order an appraisal of your new home. At this point, we can lock rates, review accurate payments, and select the right loan program for your homeownership goals. At first, the lender provides us with a conditional loan approval. This means that we need to comply with the conditions in order to obtain approval. In this stage of the process, we prove that you are capable of taking on the financing. We also prove that the home is worth lending-on as well. This is usually the longest part of the process, besides finding the home and getting an accepted offer. We ensure that you are well-informed in this phase of the process and we may ask you to provide us with more information, perhaps only updated pay stubs or bank statements. At this point everyone is working for you, from Realtors to appraisers, your insurance company, and your lender. A final approval is issued and we order loan documents. We coordinate a closing time and place with the escrow company to make sure all docuements are in-order. In most cases, you may sign closing documents in the comfort of your home or conveniently, at your office. Shortly after the lender receives your loan documents, the loan funds and the keys are yours. Its time to celebrate! 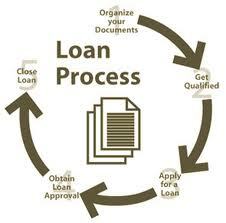 Now that you know the steps you are ready to apply for a loan with confidence. Allow us to coach you through the process, that's what we are here for!